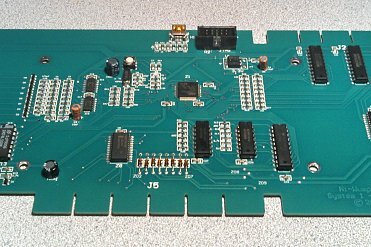 Direct replacement of the original System1 board. Enhanced switch input circuitry preventing damage to the board from playfield wiring issues.3-month warranty. Eighten years in business with thousands of boards sold internationally. Text based diagnostics menu system that allows operator settings previously done via DIP switches to be entered via front door switches. Tests that cycle repeatedly (until timeout) to help isolate faults. Enhanced use of high reliability surface-mount components with off-the-shelf thru-hole components at the edge for ease of serviceability. Display test to exercise all digit segments (numbers), and to strobe each digit independently to check for display (UDN6118) shorts. Enhanced switch test to identify stuck switches. Power-up code revision and game setting displayed for quick diagnostic configuration identification.Switch test that detects dirty switches on the playfield. All 16 System 1 games are included on one board with no ROM swapping required. Updated game options for many games to allow add-a-ball mode (multiple free-balls awarded during a single ball) where the playfield challenge is completely reset once after scoring the free-ball / special. Open-collector output logic with zener diode protection for all solenoid circuits and lamp select lines to prevent CPU damage from a damaged driver board. Battery-less operation - all settings and high-score data are stored in FLASH with >100,000 write cycles. Stuck switches are ignored and do not impair the rest of the games operation, including the slam switch!